Finals Friday - Extended Office Dropoff: Utilizing exam drop off locations on Tempe, Downtown or Poly campus will add time for exams to arrive to our office for processing. Please consider this when planning for time to work on grade postings. If you have unscored Scantrons on hand Thursday afternoon or later, it is best to deliver them directly during business hours (1130 E. University Suite 204) UNCTRB. We will extend office hours on Friday May 3 until 6pm to allow for drop off and basic questions about submitting. Any advanced scoring questions, concerns or expeditious needs are best addressed ahead of time through email: ScanAssist@asu.edu. New Drop Off Location: ASU Polytechnic faculty can easily submit Scantron exams for scoring by utilizing the drop box located in Santa Catalina Hall (Rm 233, College of Integrative Sciences & Arts). For details on how to prepare submissions, please see instructional steps below. Digital Rescores: Rescore services can be requested by emailing ScanAssist@asu.edu. In rare cases, you may need to re-submit the Scantrons for processing. Following these guidelines for scanning services will produce the most accurate reporting and quickest turn around possible. 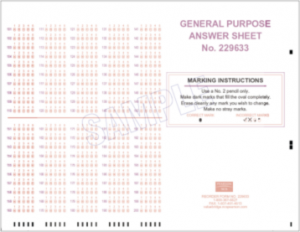 ​​​Form to use: Scantron/NCS Form 229633 is the only exam form we can scan. Purchase Forms: Forms can be purchased through Workday. In the Purchases section, use the 'Search Catalog' (formerly 'Catalog' or 'ASU Store Catalog'). "Answer Sheet, NCS #229633, ASU Materials Management, $45.19 USD/ream, 1 Day, FM700300 - Answer Sheet, Paper Materials and Products." Guidelines for Students: (You may want to read the following instructions to your students) Correctly filling in bubbles on the answer sheet is important for accurate scores. Use only a No. #2 pencil. Do not use pen. If bubbles were filled with pen, mark over them with a No. #2 pencil. Make the bubbles dark and completely fill in the proper answer. Do not leave the center of the bubble empty. Completely erase all mistakes. A poorly erased mistake may be interpreted as a response. Marks placed near the black horizontal bars or the black squares render scoring impossible. Do not fold or tear the Student Answer Sheets. Sheets must be flat. This includes sheets that may have been spilled on and dried (coffee, water, etc.). Forms that are too wrinkled to run will need to be recopied. Photocopies of forms cannot be processed. Do not make marks along the left or bottom of the front side (right or bottom of the back) of the form. This will prevent the machine from scanning the sheet. Complete an answer key for each version. Please use Scantron/NCS Form 229633 with a #2 pencil. Label this sheet, "AAA" in the Last Name grid. Leave all other information grids BLANK on the key sheet. Place answer key on top of bubble sheets. Note: If the key is missing, on the wrong form or completed in pen, you will need to bring or send in a new key. By default, the program assigns one correct answer per question, with each question worth one point. If you would like to mark more than one answer as correct for a question, would like a different point weighting for a question, would like a block of questions totaled in a separate column, want to apply extra credit, wish to omit a question or want to credit all answers for a particular question, you will want to look at these Advanced Scoring options. Be Advised: It is ultimately the responsibility of the instructor to check for accuracy on any report issued by UTSS before submitting student grades. Omit: If you decide to drop a question and you do not want the question graded, treat the question as a "blank". [KEY]: Do not bubble in any answer for this question (you can also use dry correction tape to white it out). If the students have answered a question that is being omitted, we may question whether it is intentional or an oversight on the key, so we ask that you note this on the Exam Scanning Request form. Multiple Answers: A question with multiple answers will be graded by default as an "OR" question. [KEY]: Bubble all possible answers on the key. OR situation (default): student must select only one of the possible answers in order to be correct. AND situation: student must select ALL of the possible answers in order to be correct. Credit All: If you would like ALL responses for a question to be correct. 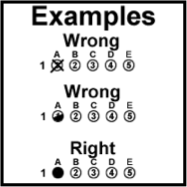 [KEY]: Bubble in a/b/c/d/e. Multiple Point Values / Weighted Scoring: An exam with questions that are worth more than one point each and you would like us to calculate that for you. [REQUEST FORM]: You MUST use the table on the Exam Request Form to indicate which question or block of questions should be weighted. Please use only integer values. Nothing needs to be indicated on the key. Subtests / Objectives: Allows faculty to specify groups of questions which pertain to specific course objectives. The bundled statistical reports will include objective-specific analysis. [KEY]: All subtests should be on the same key. [REQUEST FORM]: You MUST note the blocks of questions in the table on the Exam Scanning Request Form. You do not have to apply different weighting. If you would like to use the default 1 point for each question, simply note "1" in the point field. Extra Credit: Any question on an answer key may be designated as an extra credit question. Students answering an extra credit question correctly will receive the point value for that question as part of their total score. However, the point value for an extra credit question is not included when the Total Possible Points is computed. [KEY]: All subtests can be on the same key. [REQUEST FORM]: You MUST note which questions are "extra" in the table under Advanced Scoring Options. Rescore: If resubmitting an exam for rescore, please fill out the top and middle sections on a new request form. If you area adding advanced scoring to your rescore request, fill out the bottom section. In most cases, you will not need to send the student answer sheets back to our office for scanning. Be Advised: If you have Weighted Scoring, Subtests or Extra Credit, we strongly suggest you group the same purpose questions together. This ensures that there are no mix ups or confusions during scoring and helps speed processing. Pre printed forms can be filled out by hand in our office, or you may fill in the form digitally (Acrobat Reader required). We suggest downloading the digital form and opening it in Adobe Reader, rather than opening it in a tab of your browser window. (Don't forget to save your answers before attaching the request form to your rescore email request). Please print the request forms on purple paper. If you are not able to obtain purple paper to print request forms from our website, please add a note with your exams requesting some pre-printed forms for future use. Older (horizontal) versions of request forms are not accepted. Submit only completed sheets for processing. Make sure that no other papers or blank answer sheets are included. Do not use staples, paper clips, labels, or rubber bands on forms as these can mutilate forms. 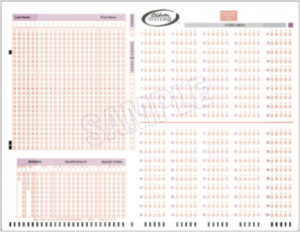 Arrange Scantron sheets to face in the same direction (most forms have a cut top right corner). Enclose each version of the test in a campus envelope to protect the forms. (One envelope per answer key). Directly hand deliver exams for scoring to Scanning Services. [UCNTRB], 2nd floor, Suite 204, located slightly off of ASU Tempe. Bike Racks are near the entrances and Atlasta deli is in the building. Yellow loading zone parking spots are available for 20 min drop off of exams. Pre-printed request forms, tape, pens, rubber bands and time stamp are provided in our office. Experienced staff are available to show you how to fill out the purple request form and properly prepare your submission. Remember to bring the answer key Scantron with you and please allow a few moments for staff to check your submission if you have prepared it before arrival. Exam answer sheets can be placed in centrally located courier drop boxes at Tempe, Downtown and Polytechnic for delivery to UTSS by ASU Mail Service couriers. The Tempe and Polytechnic courier will make two trips daily, morning and afternoon, from the drop box to our office. The Downtown courier makes one trip a day in the afternoon. Place Scantron answer sheets and completed purple Exam Scanning Request Forms inside the appropriate campus mail envelope and fasten envelope(s). Place envelope(s) in a large zip sealed plastic bag. These are highly recommended. They help to group all your envelopes together, preventing loss or damage. Print a Courier Request Form: https://sclappprod.asu.edu/courier/ and place it on the top of the envelopes in the plastic bag so that it is visible. Be Advised: Using the campus mail drop box delivery option to send exams to our office may delay receiving exam results. Tempe campus mail couriers do pick up from the drop box and deliver to us twice a day, however, exams are processed one business day from when they arrive and are time stamped in our UTSS office. Exams are processed on a first-come, first-serve basis (FCFS). The turnaround time will be one business day (excluding weekends and holidays) or sooner depending on the time of year and the number of scan jobs in the queue. We will notify you when your exam is ready, as a courtesy, in case you don't see the notification that your files are ready for download. If you need a rescore, please reply to the courtesy email and cc: ScanAssist@asu.edu , so that we may help you. Results will be stored electronically on the University Technology Office's servers. As friendly reminders, when downloading files to your computer or portable device, please remember that the information contained within is FERPA protected and follow best practices for protecting student information. Our office has no control over how long data is stored on UTO servers after the end of the semester. Results will be uploaded to your MyClasses portion of MyASU. You will have access to a PDF file for each version you submit to be graded. An Excel workbook and Canvas file will be provided for each exam bundle. Note: If, after viewing your exam results, you have questions concerning student scores or missing names on reports, we suggest you wait until you've picked up the student answer sheets to investigate the issue before contacting our office. Most likely we have already sent the scantrons back to you, so we may not be able to help. You are welcome to request rescore services, if needed. Each version of the exam submitted will result in a bundle of 7 reports combined into a single PDF file. Below you can view samples of each report along with explanations of the statistical information provided within them. Excel Workbook: An Excel workbook that can be opened in Excel versions 2007 and newer will be automatically provided. 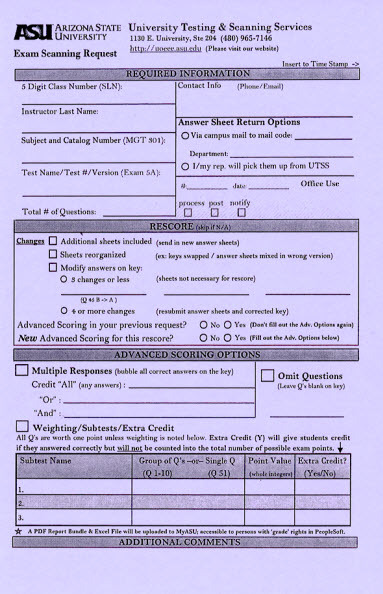 The file contains a "Simple" worksheet containing Student Name, ID, and Overall Total Score, as well as a worksheet with the "Raw" scanner output of all fields. If you submit more than one version of an exam, you will get both the separate results and a worksheet with merged results. Canvas Import File: A Canvas file will be provided for each bundle of exams submitted for a course. Some manipulation in the Canvas system may still be required by faculty. Please contact the LMS group for questions related to Canvas. PDF Report Bundle: Click the images below to download sample reports with statistical definitions. Provides a detailed grade report, with a table of all answers chosen by students. 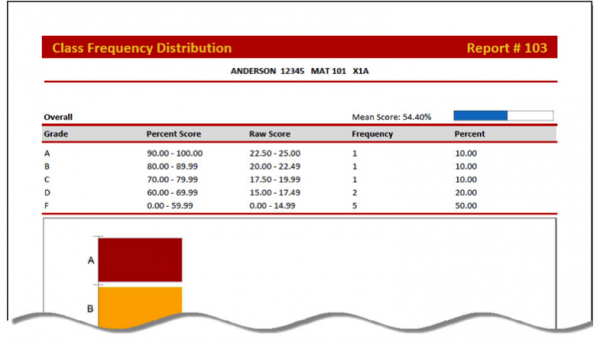 Displays the frequency of various ranges of raw scores for an entire class, as well as the mean score. Summary of basic exam statistics: exam results as a whole, analysis of each question, group responses and point biserial calculation. Graphical representation of each question on the exam, including the frequency of responses provided by students for each question. Provides an overall look at point values assigned to each question and the number of students total who answered correctly or incorrectly. This report shows "no responses" as well, which can be useful for exams that ask students to only answer certain questions based on other pre-defined criteria. This report is most useful for instructors who utilize Advanced Scoring Options. Provides a detailed grade report for each student who took the exam. Each student report appears on its own page, making it useful if you choose to distribute them to students. Please make sure to provide an accurate campus mail code on the Exam Scanning Request form. Mail services picks up exams from our office once a day. If we complete the processing of your exams after they pick up, your student answer sheets will go out in the mail run the next business day. This may take longer for you to receive Scantrons. You must show ID when picking up your scanned answer sheets. They can be picked up after one business day (or if you see results sooner on MyASU). Exams must be picked up within 30 days. We cannot store or destroy these documents. Due to limited storage space, exams left for longer than 4 weeks will be mailed back to the faculty member through inter-campus mail. UTSS is not responsible for lost or misdirected inter-campus mail. If resubmitting an exam for rescore, please fill out a new request form. Be sure to complete the middle “Rescore” section. In some cases, you will not need to send the student answer sheets back to our office for scanning. Additional sheets included: If there are no changes to your key and you just need to add some late sheets to a previous submission, send in only the new answer sheets. A wrong key was placed with a version of the exam or answer sheets mixed in wrong version: Please resubmit all answer sheets with the new key on the top. We will need to re­scan the key(s) and the student answer sheets. 3 changes or less: It is now possible for tests to be rescored digitally without rescanning the student answer sheets. To request rescoring or if you have questions or concerns, email: ScanAssist@asu.edu with "Rescore" in the subject line of the message. Fill out the Rescore section on the request form and attach it with your email. You may still submit the answer sheets for re-scanning in the traditional manner if you prefer. 4 or more changes: If there are more than three changes that need to be made on the key, it usually indicates that there was an error that requires more attention and detail. To avoid unneeded rescores, we request the professor/TA resubmit the student answer sheets and include a new key that has been checked closely for accuracy. One business day turn-around is based on the time the rescore request is received by UTSS staff. We will upload the new results to MyASU. We ask that you please do not hold homework, quizzes and other scantrons that need processing until you submit your finals. We experience an overwhelming load the week before finals and the week of finals. If you have scantrons that need processing for your end of semester grades, if possible, please send them to our office as soon as they are completed by students rather than holding them until you drop off your finals. Finals Friday - Extended Office Dropoff: Utilizing exam drop off locations on Tempe, Downtown or Poly campus will add time for exams to arrive to our office for processing. Please consider this when planning for time to work on grade postings. If you have unscored Scantrons on hand Thursday afternoon or later, it is best to deliver them directly during business hours (1130 E. University Suite 204) UNCTRB. We will extend office hours on Friday May 3 until 6pm to allow for drop off and basic questions about submitting. Any advanced scoring questions, concerns or expeditious needs are best addressed ahead of time through email: ScanAssist@asu.edu. If you prefer to discuss on the phone, please leave your best number in the email and we will reply or call back during regular operating hours. Building UNTRB note: Yellow loading zone parking spots are free 20 min parking for drop offs. If no loading zones are available, Lot 59E (cross parking) is close or there is hourly parking available next to the building in Lot 55 (cross parking after 4pm only). Green considerations: Bike lock up racks, water bottle refill stations, on bus route and golf cart paths.